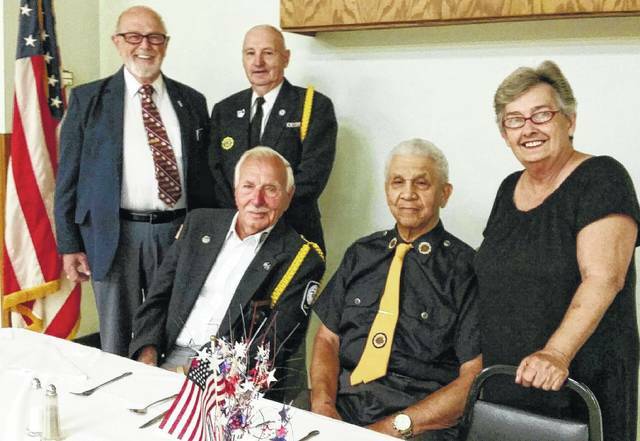 From left to right, veteran Paul Sands (Legion Post No. 25 Boys State Chairman), veteran David Fredrick (Boys State Committee Member), [seated] veteran Ed Fisher (Boys State Committee member), veteran Charles (Buck) Harris (Legion Post No. 25 District Boys State chairman) and Patti DeWees (Boys State Committee member). Recently, American Legion Post No. 25 held a dinner reception for the parents and the local young men who attended the 2017 Buckeye Boys State. Boys State is a national program founded by the American Legion to promote patriotism and to provide an understanding about how our government works. Ohio continues to be the state with the most attendees. This year Fayette County sent 14 boys to this state-wide endeavor. It costs $300 to send one boy for eight days of educational fellowship. The working premise is: Set up a town and fill all the positions it needs to succeed from mayor to sanitary engineer. The boys all praise the experience and most say it was the experience of a lifetime. Most parents want to know what happened to the child they sent away? They are going home with a young man! David Fredrick, American Legion Post No. 25 Boys State Committee member adds, “This is a fine group of young men, all tops in their classes and that is all on you, the parents. Thank you.” After a wonderful meal the boys each took to the podium and introduced their parents and briefly shared their experiences at Boys State. The sponsors for this year’s trip were Gene Elliott, CJ Auto, Easy Oil Change, David Ogan-Carol Halliday Ford, Street Side 62, The Keg, Our Place Restaurant, Jason Langley-Realtor, Bill Junk, Doug Marine Motors, Lewis and Langley, Rancher’s Roast Beef, Rowland LeMaster-Parrett Insurance, Title Department, Cathy Templin-County Recorder, Evelyn Pentzer-Clerk of Courts, and Susan Dunn-County Treasurer. If you would like to know more about Buckeye Boys State or would like to donate to help send even more boys next year, please call the American Legion Post No. 25 at 335-4990.
https://www.recordherald.com/wp-content/uploads/sites/27/2017/07/web1_2017072695.jpgFrom left to right, veteran Paul Sands (Legion Post No. 25 Boys State Chairman), veteran David Fredrick (Boys State Committee Member), [seated] veteran Ed Fisher (Boys State Committee member), veteran Charles (Buck) Harris (Legion Post No. 25 District Boys State chairman) and Patti DeWees (Boys State Committee member).